Designed by our own Tim Chauvin, this house is another hybrid structure and has affectionately been named "Star" by its owners. 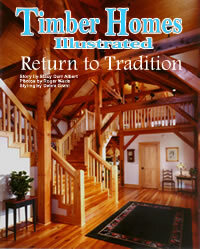 The home was featured in the June 2000 issue of Timber Homes Illustrated and received the most reader comments garnered by any home up to that issue. The inspiring entry and all of the living spaces are timber framed, while the bedroom wing is constructed of structural insulated panels. 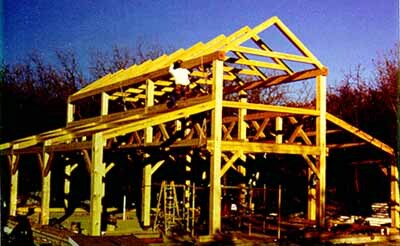 This unique frame features parallel chord trusses in the Great Room and "X" braces, in addition to the more typical knee braces seen in many timber frames. The frame is crafted from timbers that at one time were part of a river boom in Ontario, Canada. The 14" x 14" timbers were remilled and then dried in our dry kilns. The resulting timbers have a rich color as well as prominent character marks caused by a chemical reaction between the tannic acid in the timbers, the water of the river and iron rods and chains used to keep the boom together. The adjacent Car Barn was designed to complement the home. The Car Barn is home to a number of high-performance motorcycles and vintage automobiles. The upstairs office/apartment has a unique deck off the back that doubles as a platform for a high powered telescope that is hard wired to computers inside that both control the telescope and record the images. 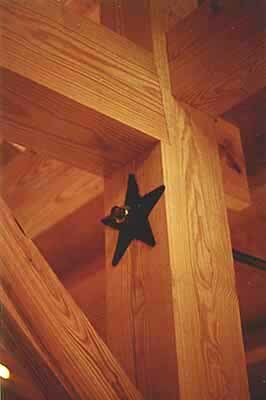 Star with an Award of Merit for Excellence in Wood Design, Residential Category. This is Red Suspenders' first such award in this category. The plaque now graces the front entry way of Star and is a delight to its owners and visitors. click to enlarge and learn more about each section.